Now we explain how to call Visual Graph functions through a VB6 example. Please note that the function Type must be set as Public to let other programming languages to access it. 4. Create a new project in VB6, right-click on Toolbox and select Components, and then check Visual Graph ActiveX Control and click <OK>. 5. Click vgctrl in Toolbox, and then draw an instance on Form1. 7. Run this project, you will get a message box with 50 prompt, indicates there are 50 circles generated. 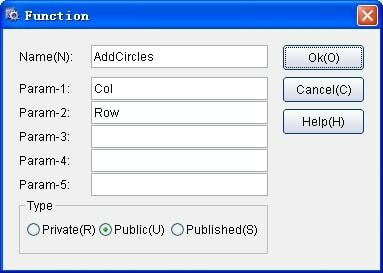 vgctrl1.vg.ActiveSheet.Execute "AddCircles( " & cstr( col ) & ", " + CStr( row ) + " )"
Copyright© 2004-2019 TriSun Software Inc. All rights reserved.